Snow is in the forecast for today. We’re not to get hit as hard as if we were still in New York City, but still a sizable amount. It’s good day to stay inside and do artwork…as if that wasn’t what I’ve been doing for the past week anyway. Ah, I love the snow. It’s so beautiful, if I don’t have to go out in it. Be safe, all of you in the East. I did do another cat, a picture of dear Hannako. Thing is, I meant to do a drawing I could sell, but it looks so much like my little girl, and so much looks like a cat in heaven, that I think I have to hold onto it. 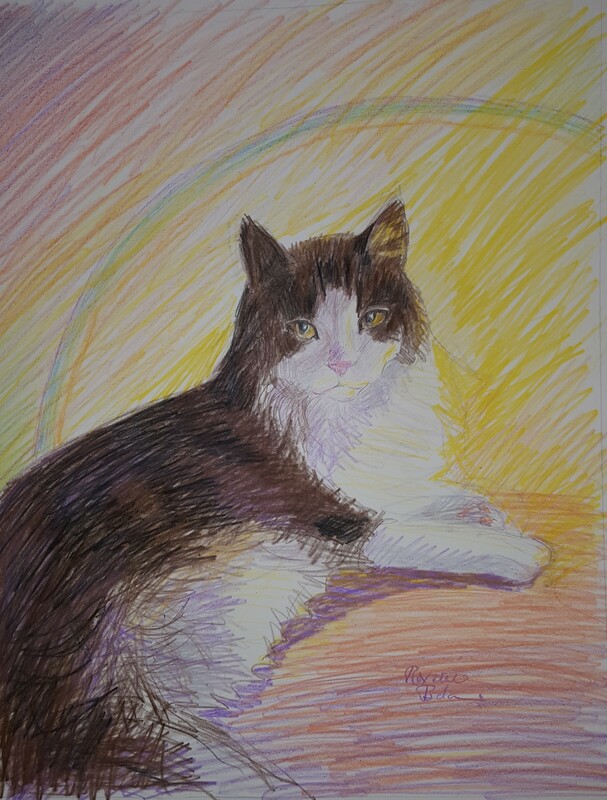 I even put a rainbow in it, for the Rainbow Bridge. I’m usually not so sentimental about things. And I’m running out of paper, again.